When you move to Boston there are three things that you must accept—you are forever a member of Red Sox Nation, you’ll never get used to someone passing you in the breakdown lane on Route 128 and the Boston Marathon is what we really celebrate on Patriot’s Day. I live half a block from the marathon route—on Heartbreak Hill—and I must confess that every year I feel claustrophobic anticipating that I won’t be able to cross Commonwealth Avenue by car. But my love-hate relationship with the marathon, my angst over feeling penned in, evaporates when I watch the runners go by. 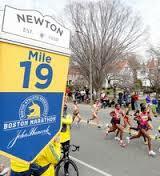 The marathon route begins in Hopkinton and wends its way through the suburbs of Boston—Framingham, Wellesley, Newton and Brookline before crossing the finishing line in Boston’s Back Bay. By the time the majority of runners reach me, they’re approaching the 20-mile mark—Heartbreak Hill. This year I watched the runners go by in the early afternoon—the height of the marathon on my little stretch of the race. Where I live, the marathon is a party. People bring picnics and watch the race on folding chairs. We look for the names of runners on their shirts or written in black magic marker on their arms. Go, Margaret. Last hill, Bob. Every year I am in awe. This year, I watched my fifteen year-old son clap and whoop for every runner. He’s a runner too and thinks nothing of taking a five mile run. I am, at the moment, training myself to go around the block in the hope that I can run a 5k road race this summer. I’m almost halfway around my block without stopping. Heartbreak Hill, indeed. By four o’clock in the afternoon, the 2013 Boston Marathon was no more. Commonwealth Avenue was empty save for the occasional police car and yellow school bus picking up stranded runners. Not again, I thought. Oklahoma City, Columbine, Virginia Tech, Aurora, Newtown. And 9/11. Please God, not again. London, Madrid, Jerusalem. I am a compulsive reader. A Kaddish reader. After 9/11, I gazed into the eyes of every victim and read their accompanying word portraits. Lives thrust into the news, engraved in our hearts. Their memories for a blessing. I’ve said that too often for people I’ve never met, but somehow are not strangers to me. It is deeply disturbing to live so close to an act of terrorism that happens during such a quotidian event. My teenager and his friend didn’t take the T to the finish line because of inertia—easier to hang out in our suburb. Yet he’s cultivating his independence and one of the ways he’s learning to do that is getting around Boston on public transportation. After last Monday, how do I keep him safe? How do I help him stand down fear? The day after the bombing, I was glued to the television and radio. “The sadness here in Boston is palpable,” said one reporter. Everyone who called in or was interviewed was testifying about something—their love for Boston, their relief that a loved one made it safely across the finish line, their dream of completing the marathon cruelly derailed. People were stunned and grateful that they were in Back Bay at the right time and the right place. Each one of them mourned for the victims. For eight year-old Martin Richard who loved riding his bike and playing ball, who hoped for peace after the Newtown shootings. Martin Richard, everyone’s child. For 29 year-old Krystal Campbell cut down in the prime of her life. And yet for me the psalm has the potential to offer solace in the same way that the Mourner’s Kaddish praises God and doesn’t say a single word about death. Sometimes, though, I think this God of ours is too demanding of our loyalty without giving much in return. I can’t depend on God to keep my children safe. Or can I? Do we devise our fate or is it pre-ordained? Containing four dead and eleven wounded. To no end and no God. This entry was posted in Current Events, family life, Parenting by judy bolton-fasman. Bookmark the permalink. Very well said – truly horrifying that we are once again mourning for innocent victims of terror. Thank you Judy, for expressing so much of what I’m feeling. I thought of Amichai’s poem instantly, Judy, the minute I heard the news. Beautiful article. Thank you, Judy. No other words from this writer, this word person.